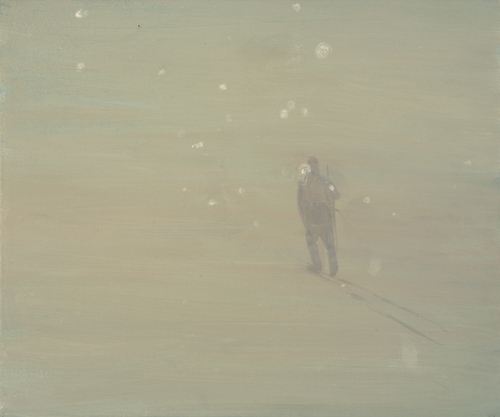 Selma Makela, Hill Walker, 2010, oil on canvas, 10 1/4 x 11 3/4". Rejecting the tyranny of dreariness typical of London in midwinter, this show expectantly embraces transience in nature. Films by various artists and a group of paintings by Selma Makela touch on the ephemeral. Anna Barriball’s film Projection, 2003, harnesses the intangible: The artist stands at an open window as sun cascades in, reflecting coruscations off her rhinestone shirt. Similarly, Rachel Lowe’s series of video shorts A Letter to an Unknown Person, 2008, captures the artist’s attempts to draw Magic Marker outlines of the fast-moving landscape outside onto a car’s passenger-side window. As the films progress, the traced shapes of fugitive scenery accumulate to obscure the view. Charles and Ray Eames’s Blacktop: A Story of the Washing of a School Play Yard, 1952, also uses passing moments of abstract forms, as soapy water full of bubbles flows wistfully and sinuously across gritty black tarmac to a sound track of the Goldberg Variations. Evocative of “skying,” the British tradition of contemplating clouds as practiced by the likes of John Constable, the film ultimately captures the banal reality of water mixed with soap suds in bewildering formations of transcendent, mesmerizing abstraction. Makela’s small-scale oil paintings of the physical world—ice, snow, meteors, solar storms, and so on—are distillations of the ephemeral environment, made vulnerable as it is made permanent on canvas. Like stars coalescing into a glittering constellation, this dual exhibition quietly provides, through the assembled works, a fresh view of natural phenomena.